Coffee culture is a beautiful thing the world over. In Italy, cappuccinos are only meant for the morning and in Vietnam, coffee comes with a thick layer of sweetened condensed milk. In many parts of Europe coffee is quickly consumed while standing at a cafe, and in the United States, we often take our coffee -- or dessert-like coffee beverages -- to go. Sweden has a coffee culture all its own, and a new book called Fika: The Art Of The Swedish Coffee Break explains what that culture looks like. Anna Brones wrote the book -- which came out on April 7 -- Johanna Kindvall illustrated it, and both of them developed the recipes. Together they've captured the essence of this important tradition. Fika means "to drink coffee," but as the book explains, there's a lot more to it. "In Sweden, the tradition of fika (pronounced 'fee-ka') is as common as breakfast; something almost everyone does at least once a day. It factors into planning, work schedules, and even a relaxed weekend at home. Life without fika is unthinkable." Coffee is classic but tea is also common. It's customary to have a sweet snack on the side, but enjoying a beverage on its own is also okay. And people go about this daily ritual on their own or in the company of others. Whatever fika looks like, the point is that people deliberately carve out time in their day. It's this intention to slow down and take a break that makes it such an important part of daily life -- one that not only connects people by opening up windows to decompress and communicate, but because it's a shared value -- a tradition recognized as important throughout the country. "Fika" (the book) offers recipes for some of the most classic snacks eaten during this Swedish coffee break. The baked goods run the gamut from breakfast fantasies to hearty breads and delicate sandwiches. Cinnamon buns, cardamom cakes, oat crisp chocolate sandwich cookies and fig squares are just a few of the traditional staples. Modern options include almond tarts, hazelnut coffee cake, sticky chocolate cake and quick buns. There's an entire chapter dedicated to enjoying fika outside, where "cinnamon buns served with a pitcher of rhubarb cordial pairs well with a warm afternoon." With whimsical descriptions and playful illustrations, the book is as charming as the tradition itself. For those who live in New York, Fika Cafe, a Swedish-American coffee shop that captures the essence of this wonderful tradition, can be found in various locations throughout the city. 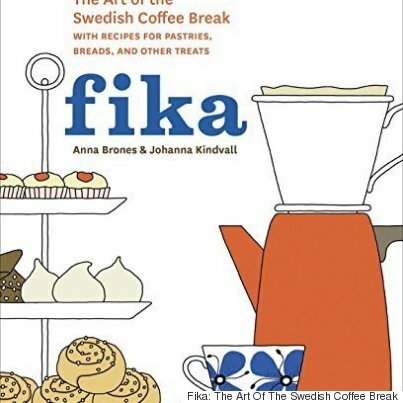 Non-New Yorkers and New Yorkers alike, however, can experience fika with the help of Brones and Kindvall's new book. Or there's always a trip to Sweden.